This story starts out as the popular Macintosh IIci to Quadra 700 conversion, but it turns into something else entirely - a completely new beast never before seen in the history of FrankenMac evolution. First a little background: I have been a collector of vintage Macs for a long time. Too long, some might say. Every time I see one for sale in a thrift shop or yard sale or by the side of the road on trash day, it comes home with me. I usually just clean or repair them as necessary to keep them running in stock form and add them to my little Mac museum. Usually. I was out driving one day and passing through a business area when I saw a beige box on the sidewalk outside of a real estate office. Recognizing it as an early Mac of some sort, I circled the block and picked it up. It turned out to be a Mac IIci. When I got it home, it went through the usual ritual of cleaning (it didn't need repairing) and taking it's place on the shelf among it's classic Mac brethren. As fate would have it, a neighbor was having a yard sale several weeks later. Her daughter had an old Mac IIvx that she only wanted a few dollars for, so that also got added to the museum shelf. It didn't even need any cleaning! Remember this IIvx; it will return later. It was about this time that I also discovered Low End Mac. Reading that the IIci could become a Quadra 700, I scanned eBay for a Quadra 700 mainboard. It took about a week before someone posted one for sale, but I got one. I was excited when it arrived, but my excitement quickly turned to dismay when I tried to fit it. Nothing lined up. I returned to Low End Mac, and there they were, those words that I hoped wouldn't be there: "case mods required". Curses! Not having done a FrankenMac project before, I decided it wasn't worth the bother, so the disassembled IIci went into a box, and the Quadra 700 mainboard went into the spare parts bin. Scan ahead about three years and see me scouring the vintage Mac section on eBay. I found an Apple PPC 601 board and made a quick visit to Low End Mac to see what it fits. Seeing that it would work in the Quadra 700, I quickly BINned it. My interest in Project Quadra renewed, I unpacked the Quadra mainboard and the IIci - but horror! At some point in the past I had moved the floppy drive and bracket out of the box they were in and put them someplace else. Drat! Like most techno-packrats, finding something that isn't in it's proper place can be a monumental task. Fortunately, it had only managed to migrate as far as the box underneath the one that it had originally been put into, so I was in luck. While waiting for the PPC board to arrive, I decided to start the IIci case mods. I had already snapped off some tabs in the bottom that the IIci board needed, but that weren't present on the Quadra board. This left the fit a little loose, but workable. The big part of the project came when I had to cut the openings for the ports in back. A utility knife and sandpaper was used to make a nice opening without too much of a ragged edge to it. The utility knife was a little tough to work with and gave my hand cramps, so I tried heating up a carpet knife, but the stench of the melted plastic was unacceptable. (I keep birds as pets, and they die easily from bad air.) If you decide to use the hot knife approach, do it outdoors. I also cut away a fair portion of the metal shielding with tin snips, as it either interfered with the fit or directly contacted metal with the mainboard fitted - and I didn't want any short circuits. A little sanding and the opening looks good. The mainboard fits, and everything plugs in nicely. In about four days, the PPC 601 board arrived. Anxious to try it out, I trial fitted everything outside the case to be sure it all fit together and worked properly. Then I realized something. I had no hard drive to boot up with. The IIci I found didn't come with one. I could power it up, but there would be no OS with which to test it. Then I remembered the IIvx. It had a hard drive, so out it came for the testing of Project Quadra. With the IIvx hard drive connected to the pile of parts, it was time to power up. I connected an old 14" Apple monitor to the mainboard and hit the power button, fully expecting the whole mess to blow up in my face, but it didn't. In fact, it worked quite nicely. There was a problem, though. 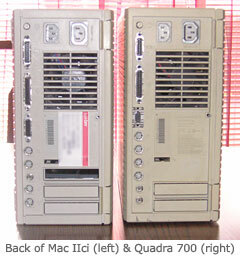 The Quadra 700 board showed only 12 megs of RAM under "About This Mac". This was obviously unacceptable. Not wanting to spend any money, I checked all the machines at my disposal for a RAM donator. Fortunately, the previous owner of the IIci did me the best favor anyone possibly could and upgraded the memory with top quality parts! The little Viking head with the horned helmet on the four RAM SIMMs made me smile. I pulled them and plugged them in to replace the 2 MB SIMMs that the Quadra board came with. They were taller than the low profile Quadra SIMMs, and I had read that the RF emissions so close to the floppy drive can cause it to fail, but I was desperate to get this 3-year-old project finished. Powering up with the new SIMMs gave me a very pleasant surprise. "About This Mac" now reported 68 Megs of RAM, the full allotment for a Quadra 700! Now to try the PPC 601 board. Uh oh! Bombs. Do I need a driver for the 601? Is the board bad? I don't know. I'll be researching this issue and updating when I know more, but for now I'm happy just to have a Quadra 700, even with the standard 040. So with a working Quadra 700 in a IIci case, we reach the end of the story, right? Not quite. Remember the IIvx? It reenters the picture now. Having it's case open and it's hard drive out got me to thinking (which usually results in a visit from the police, paramedics, or fire department, so this is a very dangerous thing). 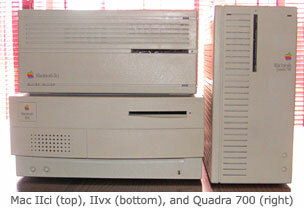 I was thinking how nice it would be if Project Quadra had an internal CD-ROM drive. There is no slot in the IIci case for one, and I didn't want to hack it up any more to make one - and there wasn't really what I consider sufficient room for it in there, and some sort of weird cabling would need be to be devised to reach the SCSI port as well as a support system to keep it from resting on the mainboard. That IIvx case was looking more and more like a better home for the Quadra mainboard than the IIci case, but would it fit?? First I had to get everything out of the IIvx case to get a clear view of the mainboard. It took a bit of tinkering to figure out how everything was held in place, but I managed to get it all out, and guess what? The IIvx mainboard is exactly the same form factor as the Quadra 700/IIci boards. Better still, all the port locations on the IIvx mainboard are in exactly the same places as the Quadra 700 mainboard. No case hacking required! Even the single screw hole in the center of the motherboard lines up. One tab has to be removed from the bottom of the case, but these are held in place with clips and can be removed without breaking them. Once you remove that tab, you have a flat surface for the Quadra 700 mainboard, and it fits more securely than in the IIci case. With the Quadra mainboard in place and securely screwed down, it was time to put everything back together. When reassembling, it's best to plug the drives into the mainboard before you put the power supply back in (the IIci power supply and the IIvx power supply seem similar enough, and both worked with this project) or else you won't have enough room to get your hands in under the bracket that holds everything together to plug them in. I did hit one minor snag here. The Quadra 700 mainboard doesn't have a set of CD audio pins to connect the audio outputs from CD-ROM drive to. It's okay, though, as I wanted the CD-ROM drive for loading software rather than listening to CDs. Another point worth mentioning here, since it's related, is that the internal speakers from the IIci and IIvx use a 2-pin plug. The Quadra 700 mainboard has a 3-pin speaker plug. No matter how I oriented the plugs from the IIci/vx speakers, I couldn't get so much as a startup bong out of either of them. I think a 3-pin speaker from a real Quadra 700 will be needed for sound. With the drives and the power supply back in, we arrive at the moment of truth (for the third time). Power up. Again, success! Does the CD-ROM work? Let's find out. The IIvx hard drive had System 7.5.5 installed on it. I have a Mac OS 7.6 CD that I use for upgrading older machines that can handle it, so in it went. It was so nice to see that CD-ROM icon appear on the screen. Unfortunately for me, either the hard drive that came with the IIvx was stuffed full or it was too small to do an install of 7.6, as I got an error message from the installer saying there was insufficient space on the hard drive. Not knowing the capacity of the drive, I didn't want to format it only to find out it was still too small, so I just left it with 7.5.5 for now. If you're stuck with a IIvx with it's fast 68030 and slow system bus and have access to the parts, you can upgrade it to a full 040 (or possibly a Apple's PPC 601 Upgrade Card, if you can find one) on a speedy bus, and you'll have a unique (well, unique apart from mine) machine to impress everyone down at the vintage computer club and run your 68k Mac software faster natively than almost anything. Only the Quadra 840AV and 950 will still outrun it with the 040, and I have to note here that the 840AV - the fastest of all the 040 Macs - doesn't accept the 601 board, which makes this machine faster. There were also chipping kits sold that can make the Quadra 700 even faster, either with or without the 601 board installed. Of course, you can also turn your IIvx into a Power Mac 7100 (my original plan for the IIvx), but that involves swapping the bottom of the IIvx case for the bottom of a 7100 case or hacking up the IIvx case to make the 7100 mainboard fit. I think I like this mod almost as much. My biggest problem now is deciding whether I have the only IIvx with an 040 on the motherboard or the only Quadra 700 with an internal CD-ROM. Photos are from Low End Mac's collection.